On Earth, the line of zero degrees longitude runs through Greenwich, England. What about other planets? Unlike latitude, longitude has no physically defined starting point. Zero degrees of latitude is at a planet’s equator and is easy to establish from the body’s rotation (although as noted by Wikipedia, technically it also depends on the “reference ellipsoid” chosen to model the body). In contrast, zero degrees of longitude can be wherever you want it to be. However, change it with caution: any modifications mean that all of your previous maps and published locations have to be updated! This happened on Mars. Originally (1830), the line of zero degrees was set to be a point in a dark region that was 40 years later named (due to its utility) Sinus Meridiani (get it?). (C) Mars Global Surveyor in 2001. However, this crater is still large enough (500 m across) to not be a very satisfying reference point to measure distances to other features. If you use a yardstick to measure that distance, where inside Airy-0 should one end of your stick go? You want your reference point to be as small as possible so that everyone measures distance the same way. What do we have on Mars that is very small but very recognizable? Our landers! But we don’t want to pick a new prime meridian. If we did, we’d have to change all our maps and localized data — a huge and infeasible task. Instead, Mars cartographers did something very clever. They kept Airy-0 as the 0 point, then carefully calculated the longitude of the Viking 1 lander with respect to the center Airy-0. Why that lander? Because it’s been there the longest, so it provides a consistent reference point for all data going back to 1976. At the time Viking 1 landed, its location was known only to within 0.1 degree (~6 km). Its location is now known much more precisely. I was unable to find the exact number, but it’s at least an order of magnitude better. So today, all longitudes of Mars surface features or objects can be calculated with reference to the Viking 1 lander (at 48.222 deg W, not 0), enabling much higher precision in localization! This issue has become even more challenging with the discovery of exoplanets – including some for which we are starting to make maps. How shall we pick their prime meridians, without being able to see surface features? This just in: Europa, the moon of many mysteries, has been declared to have the icy equivalent of plate tectonics. There are other areas that consume ice so the total surface area is constant. On the Earth, new crust is created at the mid-ocean ridges. It moves outward and then is consumed at subduction zones (like the coast of California). But to date, no one has seen anything like that on Europa. At this year’s Lunar and Planetary Science conference, Simon Kattenhorn and Louise Prockter presented the first evidence for a subduction zone on Europa. It’s curiously curved, and they’ve only found one so far, but it could provide the missing part of the story of how Europa’s surface changes over time. There are some remaining details to work out (ice can’t subduct exactly the way crust does on Earth), but it’s certainly intriguing! You can read Kattenhorn and Prockter’s two-page abstract here: Subduction on Europa: The case for plate tectonics in the ice shell. For a very nice, accessible discussion of the context and importance of this work, I recommend Emily Lakdawalla’s discussion (and images). Does the Earth rise, seen from the Moon? It is an arresting view: our Earth, seen from the outside. But not just from afar: from another place in space. The lunar landscape gives it a certain awe-inspiring context. How small our Earth looks against the vast stretch of the lunar horizon! Yet despite its beauty, this photo has irritated me for some time. It is titled Earthrise, a poetic and yet almost entirely misleading name. How many people have seen this photo and come away thinking that the Earth rises on the Moon? How many still think that? However, the astronauts were not standing on the surface but instead in orbit around the Moon, so from their perspective, the Earth came shooting up over the horizon, an artificial Earthrise. That’s not quite right. Today I learned that the Earth isn’t entirely stationary in the lunar sky, because it (the Moon) librates (wobbles) a little bit back and forth, which makes the Earth appear to move slowly, subtly in the sky, over the course of a month. Perhaps more interesting to the observer is the fact that, from the Moon, the Earth goes through phases (as shown above). Orbital geometry aside, these photos are just breathtaking. And the idea of our blue planet rising, sailing overhead, and then setting is such a dramatic and captivating one! But not reality. As you now know. China’s Chang’e 3 mission means that we (humanity) once again have an active rover on the Moon, Yutu. It’s been a while since the Russian Lunokhod 1 (1970-73) and the Apollo LRVs (1971-72) were roving around on the surface! And now we have some beautiful pictures from the Chang’e 3 lander and Yutu, which pointed their cameras respectively at each other. Delightful! 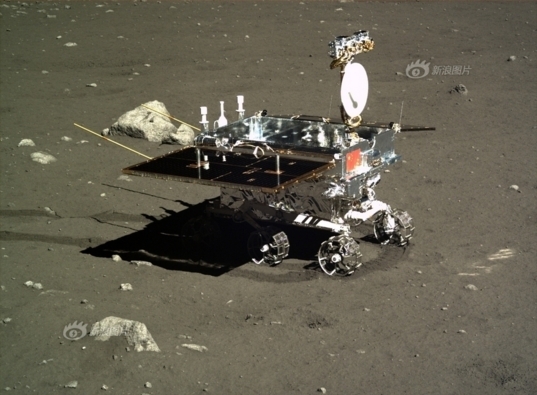 The Yutu rover is subject to some interesting operational constraints. It is powered by solar panels, which means that it can operate during the lunar day, but not the lunar night. Each of these lasts for two Earth weeks, so the rover operates for two weeks and then hibernates for the next two. It landed on December 14, 2013, and operated until December 25. It hibernated until January 11 and then woke up to resume operations. In a few more days, the sun will set and it will again go into hibernation. During the long, cold night, it relies on radioisotope heater units to keep it sufficiently warm for the wakeup to work. 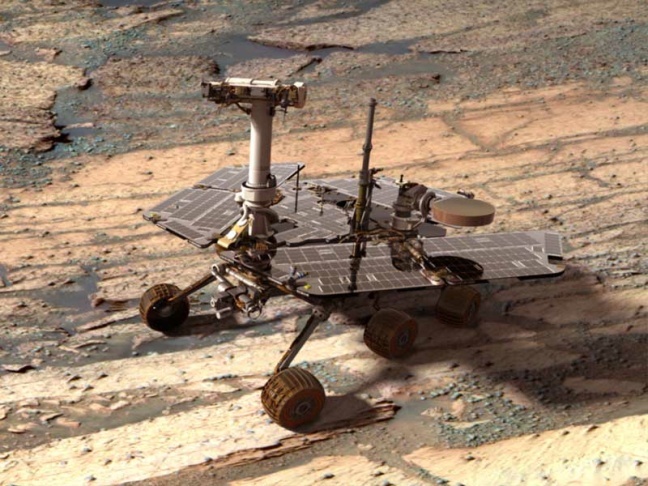 In contrast, the Mars Exploration Rover Opportunity, which is also solar-powered, operates on a different timescale. It enters deep sleep each Martian night and wakes up each Martian morning, but the Martian day (sol) is much closer to an Earth day: 24 hours, 40 minutes long. This sleep is, indeed, deep: the rover disconnects its batteries from its Power Distribution Unit so nothing can draw any power. In the morning, sunshine on the solar panels causes the rover to reconnect its batteries and start running again. This mode of operation wasn’t part of the original plan; it was implemented after the rover’s first 100 sols when a stuck-on heater threatened to drain the rover of all battery power overnight. Forcibly disabling the heater by disconnecting the battery every night has kept the rover going for an additional 3450 (!) sols (to date). 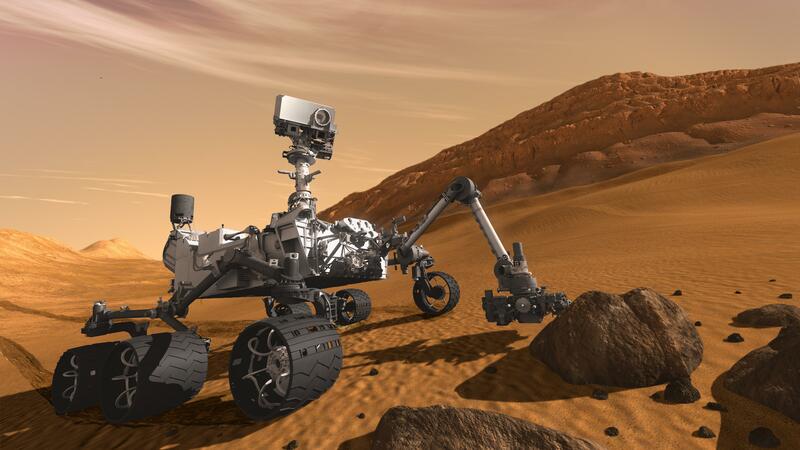 The Mars Science Laboratory rover (Curiosity) has no solar panels and therefore, in theory, can operate at any time. In fact, it has done some nighttime surface imaging because it is unaffected by the position of the sun (and shadows) at night. It has also done some stargazing and collected images of the two moons of Mars at night. However, the rover has no headlights, so night driving would be risky; to my knowledge, it hasn’t been attempted. And nighttime operations require that more energy go into the heaters to keep the electronics warm enough, so they’re more costly from a power perspective. Still, it must be nice to be free of a forced hibernation. For maximum flexibility: carry your own power source! I recently joined the Mars Exploration Rover team as a TAP/SIE (Tactical Activity Planner / Sequence Integration Engineer) for the Opportunity rover. That means it’s my job to sit in on the morning SOWG (Science Operations Working Group) meeting, in which the rover’s scientific goals for the day are set, and then work with payload, thermal, downlink, mobility, and other experts to come up with a plan to achieve those goals. What pictures will we take? When? Where will we drive? Is there enough power? Reading the training documents only gets you so far. I’ve just begun “shadowing” the current TAP/SIEs so that I can learn on the job, watching over their shoulders through a day of planning. My first shift was on Wednesday, and it was supposed to be an “easy” day: pick one of two rock targets, drive towards it, and take some pictures looking backward at yesterday’s tracks. Scientists dialed in from all over the country for the SOWG meeting. After some debate and consultation with the Rover Planners, they settled on the rock that had the easiest approach. The scientists signed off and we went to work building the plan. The TAP/SIE’s job is facilitated by a bewildering array of scripts and tools. These allow for the setup, development, refinement, and checking of the plan. Are power or thermal constraints violated? Do we have enough onboard storage space for the new images to be collected and enough downlink allocation to get them back to Earth? While the RPs (Rover Planners) settled in to their job of constructing the drive sequence, we worked on the full sol’s plan (a day on Mars, which is 24 hours and 40 minutes in Earth time, is called a sol). Very quickly we realized that the planned drive, despite covering only a couple of meters, would drain the rover’s battery dangerously low. Opportunity was starting the sol at only 80% charge because of two long instrument observations the previous sol. We modified the plan to give the rover a morning “nap” in which it could sun itself and collect power, like a desert lizard. That helped the power situation, but not enough. Several iterations later, we finally squeaked by at 0.1 Amp-hour above the required threshold. Meanwhile, the RPs were growing concerned about a different problem. 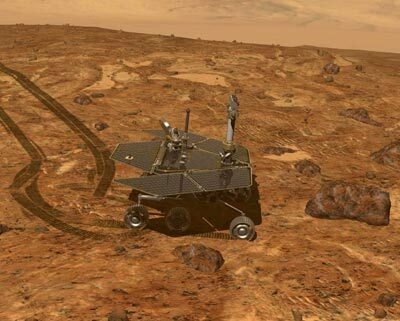 To reach its goal, Opportunity would have to straddle a rock that, while small by human standards, could pose a risk to the rover’s instrument arm, which dangles slightly down when stowed for driving. The RPs put their 3D simulation of the rover and the terrain up for all to see, and we stared at the screen while they spun the rover and tried to examine the rock from all angles. A few minutes later, a scientist on the telecon asked, “Can’t we just put the arm up?” but was quickly shot down by the TUL (Tactical Uplink Lead, head planner): “Too risky.” The TAP/SIE and I grinned at each other. Ultimately, it was deemed too dangeous to drive over the rock with our current data (images the rover had taken the sol before), and they decided to drive up to that rock and stop. Post-drive imaging would illuminate the obstacle in more detail. At the end of our shift, which apparently was two hours later than usual, we had a plan. We ran it through multiple checks and re-checks and manually confirmed all of the sequences. The final walk-through was punctuated with “check!” coming from different areas of the room as each person confirmed that their part was correctly represented. The plan was finalized and transmitted to the rover using the Deep Space Network later that night. There’s nothing like seeing a job in action. I learned a lot about the steps involved in planning and (unexpectedly) a lot of re-planning. For the rover, today is “tosol” and yesterday is “yestersol.” I got to practice the phonetic alphabet, which is used to communicate letters (in rover sequence ids) with a minimal chance that they will be misheard. I even got to help out a bit as a second pair of eyes to catch typos, spot constraint violations, and suggest alternative solutions. And I’ll be back on shift next Monday!